Whit Tice graduated with an MBA from Case Western's Weatherhead School of Management in 2008, followed by a master's degree in Positive Organizational Development and Change, also from Case Western. After graduating in 2009, freelance consulting work became his mainstay as he carried out a dedicated job search in CSR. In a candid and thought-provoking chat with Vault's CSR Editor Aman Singh, he discussed his business school experience, how his penchant for systems thinking evolved into change management and organizational development, and whether his prolonged job search ever made him question his new career path. Whit recently started working as a Change Management Senior Consultant with business and technology consulting firm Logic 20/20. He continues to discuss systems thinking and organizational development through his blog, The Organizational Strategist. I've always been interested in sustainability and environmental issues. Growing up in the Washington state area helped in this regard because there is more knowledge about such concerns and a prevalent culture that appreciates and respects the environment. I've worked with small software companies doing project management, security, quality testing and so forth, but was never exposed much to CSR or sustainability beyond my own interests. It was through my higher education, my graduate business school at Case Western Reserve University, that this was formalized. In business school, the importance, relevance and sheer scope of what encompasses CSR and sustainability became much more real, relevant, and actionable for me. I first got involved through Net Impact but it was later in my graduate experience when I transitioned from just doing an MBA to doing two concurrent degrees—a Masters in Positive Organizational Development and Change—that I got more into it. I was also exposed to the triple bottom line and the three Ps (People, Planet, Profit), which made a lot of sense to me. Simply put, it's about a shift from simple thinking to complex and long-term thinking because the tradeoffs are not usually simple and transparent. This is key because CSR is going to stay relevant for many future generations. This is due to our growing population as well as dwindling resources. We need to become sustainable now. This discussion won't go away for at least a few hundred years, if ever. 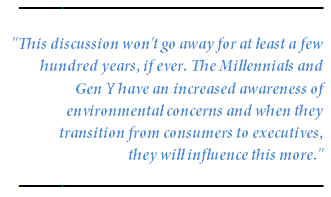 The Millennials and Gen Y have an increased awareness of environmental concerns and when they transition from consumers to executives, they will influence this more. Sustainability: Concept or definable course curriculum? I see it either as a set of different courses or a course in itself spanning different functions. For example, it can fit very well into an operations or supply chain course because it could get into all the different logistics and elements thereof. It could also be included in a human resources course to fit in with the people aspect of retaining, empowering and employee engagement. It can be a chain of classes as well because it should hit all of these areas and more. From my experience, I've observed that for a lot of organizations, sustainability is not strategic important. It it's simply an outreach effort; it won't create as much value as something strategic like hiring a Chief Sustainability Officer. The latter would send a much clearer and stronger message. That would mean there is a C-suite officer making sure sustainability hits all parts of an organization. This eventually leads to a shift in their thinking from "We need to make certain that our shareholders are happy for this next year" to "Let's make certain that our shareholders and stakeholders are happy as well as aspects like profit, talent retention, employee happiness, etc. are solid. Following that, will the resources that this organization draws upon be replenished over time?" The primary action that a CSO could do is catalyze a shift in thinking from "What are my quarterly results?" to "What impact is this organization having on three facets—people, planet, profit?" which becomes fundamentally a bigger and longer-term perspective. Corporate America needs to wake up and become aware of the reality. Without awareness there is no sense of urgency. Once they are aware of the potential benefits of CSR or sustainability, the next step is informing them of how and where this can have a benefit to their specific organization—most likely to the bottom or top line, profit-wise. Here's the disconnect: While in general, people understand that having higher morale, more workplace safety and training for employees are great, they don't necessarily tie to thinking that "this is necessary for our organization to be more profitable," because they are short-sighted in their focus. It's not necessarily of strategic importance. This is what changes if an organization understands what a coordinated CSR effort would do and how that leads to more business opportunities. My interview with Heineken for one of their PR officers positions on sustainability during the MPOD program—Masters of Positive Organizational Development and Change—should serve as a good example, albeit it was a few years ago. Besides setting up breweries and distributing centers for their beer, Heineken has created medical facilities in Africa and is the chief medical provider for the segments of that population. Now while medical facilities and beer might not sound like a typical fit, it fits right in with the cultural dynamics of Africa. For example, if one family member gets sick, the whole family unit draws in and supports the sick member as much as possible. This means the father of a sick son will not go to work. Other family members will do similar things, resulting in Heineken losing out on its work force base. At the same time, they also don't have as many consumers because this family is not going out and buying. So by providing these facilities, they are not only promoting the general quality of life, but also providing economic stimulus through more jobs as well as increasing costumers and sustaining their own employees. I had a fantastic experience at Boeing. The people I worked with were great and the projects I was on were interesting and impactful. From a CSR perspective, their focus is on developing more green fuels, which would potentially benefit their planes and other vehicles. As I saw it, sustainability, while of interest to different pockets of the organization, was not pervasive and embedded throughout the organization. Of course, all of this is from my limited personal experience, since I was one employee in a huge, global company. For example, just by going to their website and looking at their values, sustainability is its own small sub-section. By relegating it in that manner, it isn't living up to its own potential. Ironically, I think Boeing has enormous potential because if they were to try to make the triple bottom line more prevalent, with the kind of values and resources they provide for personal initiatives within the company; it would quickly become a success because there are tremendous efforts already being taken in a similar manner as the 3Ps. From a diversity and employee relations perspective, Boeing is an industry leader. An example is how the company might provide an engineer the resources to pursue his interest in art. Their encouragement goes beyond sending personnel to technology conferences. Boeing really does the people part very well. Another example of strategic emphasis is noting Boeing's strong presence in sponsorships. There are many opportunities for companies to use their corporate responsibility toward long term prospects like partnering and participating with business schools on competitions and debates so that they get more contacts and their outreach effort continue to tie in with what they actually do. Boeing, as I see it, has tremendous potential if it adopted the 3Ps framework throughout the organization. Many of its initiatives would plug right into that framework of thinking already. Due to that, I bet that the changeover of thinking and traceability would feel more like expansion and embracing the greater perspective as opposed to a mandated change, like the common structure changes that many organizations go through. Corporate Sustainability: A formalized career path or a subset of another? The primary difficulty of sustainability initiatives is their lack of awareness and clarity. Should we use "Sustainability" or "CSR"? I use the term sustainability because to me that's a broader, more encompassing term. It isn't necessarily hard to understand. Simply having an awareness of what is available, what the different eco-friendly products are and what companies are doing great things makes sustainability so much easier to understand. This simplicity can be startling and revealing for many people once they experience it. It's not that people want to go out and destroy the environment and make it so their grandchildren's grandchildren won't be able to breathe the air; it's that they just simply don't know what else to do. By having a network or a partnership of more sustainably-oriented organizations, so much good can happen. Yet, that awareness and that information aren't generally there. If we talk about needs, just getting employment is far more important than finding the kind of job. While an ideal project for me might be working with a company on their sustainability initiatives, the informal nature of CSR has made it a lot harder to find those kinds of opportunities. Even if I did find a 'sustainability consultant' job posting, would that job be considered green-washing? Would that project be based on the triple bottom line or something else entirely? I don't know. While there's the challenge of "I need to find a job" there's also the added challenge of finding the perfect fit of a job. Add the current economic climate and you get companies that have pushed their CSR and sustainability efforts much lower on the priority list, with almost no job openings in the field. Thus, on several different fronts, that ideal job is hard to find. That doesn't mean it's any less valuable though. With my focus on organizational development, I'd like to concentrate on building organizations, taking the bigger point perspective and cultivating the triple bottom line as a potential cultural and strategic change—wherever it may fit with a specific organization. For example, I have been discussing a lot of different strategy and OD topics on my blog. Sustainability fits very well with many of them, but if it's not of strategic importance to an organization, you're not going to get in easily. If sustainability isn't on a company's agenda, you won't find it easy to enter and then evangelize the triple bottom line. However, if you do get noticed for whatever it is that differentiates your approach, then it's a lot easier to talk CSR and show them the value of sustainability and organizational development. Unfortunately, both sustainability and organizational development are niche areas and not everyone even knows about them. I didn't know about the field of organizational behavior and organizational development formally until I was at Case Western Reserve University. I went there primarily for a top-50 MBA school education, with the idea of concentrating on information systems and a topic relating to working with people. It was when I got there and started talking with the deans, professors and the other students, that I really liked what the organizational behavior department had to offer. That changed my goals from simply stepping further up into management to saying, "I want to be a consultant so I can effect as much change as I can in a positive manner." Being sustainable isn't just for organizations; it's for people as well. It's like the mindfulness topic that Case Professor Richard Boyatzis teaches which can apply to organizations and to individuals. A job isn't should not just be a means to satisfy your food and shelter needs .It needs to be a job that you can keep doing over time that is sustainable in its very nature. Ideally you can model sustainability in action with a job that gives you enough money to do what you need to without compromising your ethics, morals, and so forth. That way, you can model change to others and be your own change agent. By becoming sustainable as individuals, organizational sustainability becomes that much easier. You may not be able to get a sustainable consultant job, but it may become a facet of your job once you do some other great work. It's just like any strategy: don't give up and find a way to be sustainable yourself. Pull upon all of your resources and capabilities to make it happen and it will be that much more likely to happen. It may not be the right time—this year, this month—but it will be at some point in time. I only see CSR and sustainability becoming more important over time.